Looking for a calorie-burning cardio workout that builds your core strength and your confidence? It’s time to try one of our kickboxing classes! Don’t be intimidated by the thought that kickboxing classes are only for martial arts pros. While the concept of cardio kickboxing comes from mixed martial arts training, the application is one that can be enjoyed by anyone looking for a good workout. Beginners to advanced athletes can reap the benefit of a kickboxing workout, since moves can be adapted for low and high-intensity training. Besides burning 350-450 calories an hour, kickboxing has some other fun benefits, too. Stress Relief. Along with boosting the feel-good endorphins you get with any exercise, the aggressive moves of a kickboxing workout really help to release tension. Bonus: since you aren’t actually punching or kicking anyone else, this form of aggression is both safe and legal! Energy Boost. 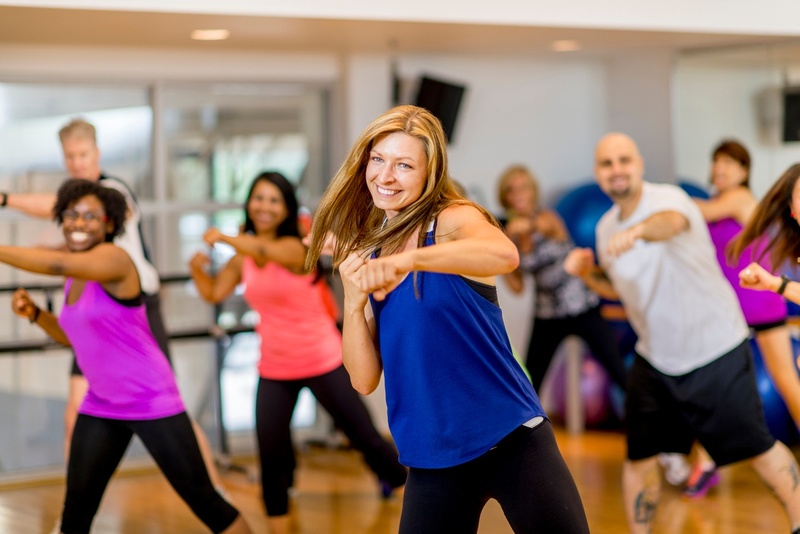 It may seem like a workout that burns so many calories would tire you out, but many class members find that the walk out of kickboxing feeling even more energized than when they arrived! You can give credit to those endorphins we just mentioned, or to the sensation of empowerment that comes from punching, jabbing, and kicking your way through a fun workout. Improved Tone and Coordination. Along with burning fat, a kickboxing workout improves both muscle tone and coordination. Front, side and roundhouse kicks work your legs and glutes, while punching and jabbing tones the upper arms, shoulders and chest. Meanwhile, all of these movements will engage your core for the entire workout. Engaging your abs will also ultimately improve coordination, as will the quick kicks and punches in the routine that make you focus to gain precision of movement. Self Confidence. As with any form of exercise, increased strength and performance increases confidence. Kickboxing doubles that benefit, since the martial arts component to the workout gives you some very basic self-defense skills. Feeling like you can hold your own in any situation gives you a nice boost of confidence. 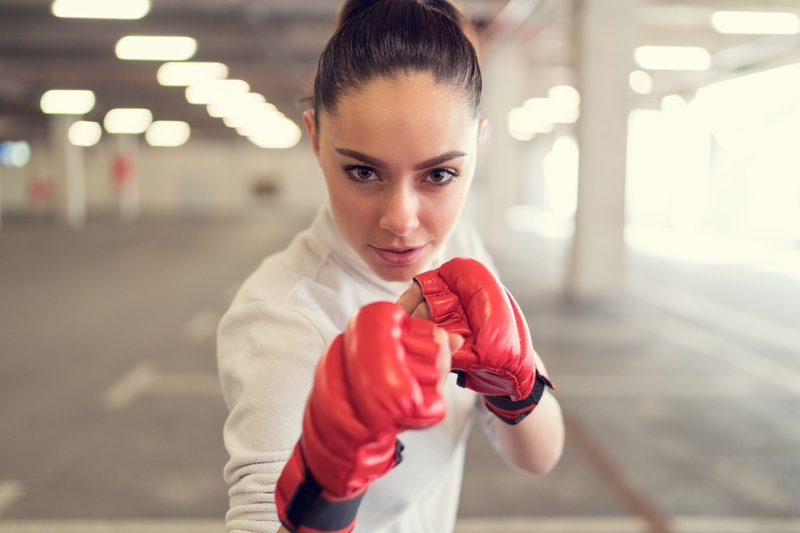 We definitely recommend our kickboxing classes as a great form of exercise, but if you want to genuinely be prepared for any dangerous situation life might throw at you, our self-defense workshops help you take your confidence to the next level. We’ve partnered with 6 Second Defense to offer you a hands-on course designed to help you be aware of your surroundings and know how to respond if you are threatened—particularly by assault. The life skills that can be gained from this course are invaluable for members of all ages and stages of life, but may be particularly useful for college students, teenage girls, travelers, and women. We’ll be posting regular updates on workshop times and locations here, so make sure you bookmark that page for future reference!